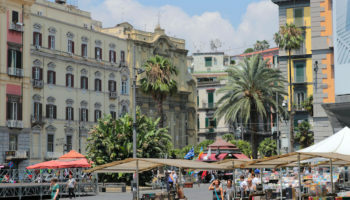 In Southern Italy, along its western coast, is the city of Naples. Founded by the Greeks more than 2,6000 years ago, this is a city with a staggering amount of history. Although Naples is one of the biggest cities in Italy, it has a more authentic, less touristy vibe than other places like Rome or Florence. Naples is packed with attractions to keep you busy, but it is also worth exploring beyond the city. These day trips from Naples are all wonderful options for exploring the best of Southern Italy. To reach Paestum, drive about 90 minutes along the Italian coast. This ancient Greek settlement is a history lover’s dream destination, and it is where you can find the largest collection of Greek Doric temples in the entire world. Not all of Paestum has been excavated, but several ruins have been unearthed and are now open to the public. The Temple of Athena is the most popular temple to tour, but don’t leave without also visiting the Paestum Museum. The collection is small, but every exhibit and artifact is impressive. Be sure to see the Grace Chamber and its gorgeous frescoes on your visit. As direct trains run from Naples Central Station to Paestum Station, it is very easy to visit the spectacular ruins, and it only takes an hour and a half in total to get there. While the cheapest tickets only cost seven euros one way, trains don’t run very frequently, so it is a good idea to check the schedule in advance. Once you arrive, you’ll see signs pointing you to all the main sights. Driving is just as simple and means you could then drive back to Naples via the breathtakingly beautiful Amalfi Coast. From the city center, head southeast on the A3 and keep on it until Salerno. Here, you want to transfer on to the SP175, which will take you all the way to Paestum. With glorious views of the Mediterranean to your right, it is a lovely drive that takes around an hour and a half. An hour’s drive south of Naples will take you to Sorrento, a beautiful town with a scenic port, popular beaches and fantastic eateries. Work up an appetite at the Marina Piccola, the busiest and most sandy of the local beaches. Then, learn a little more about Sorrento with a stroll through the Museo Correale di Terranova, which is packed with an extensive art collection, or tour the local Duomo, or cathedral. Don’t leave without indulging in the filling baked pasta dish called Gnocchi alla Sorrentina. For dessert, a scoop of gelato is refreshing on a hot day, and the local specialty features fresh pieces of citrus fruits. From Napoli Garibaldi, it takes roughly an hour to get to Sorrento by Circumvesuviana train. The views of the Gulf of Naples as you go are astounding. Once you arrive, it is just a short walk to the center. After having seen Sorrento, you could visit the picturesque Positano, which is a 40-minute bus ride away. While it is only 50 kilometers to Sorrento from Naples, it still takes around an hour to an hour and a half by car, depending on traffic. Head southeast out of the city center and take the A3 until Pompeii, where you turn off and follow the SS145 all the way to Sorrento. The coastal roads boast breathtaking views, and going by car means you can continue on to visit the Amalfi Coast, which is home to lovely towns such as Positano and Amalfi. To make the most of your time in this beautiful part of Italy, you may want to consider taking a guided tour that takes you to see some of the best places along the Amalfi Coast. 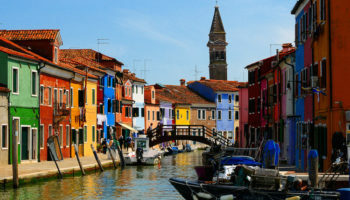 As you can tailor the tour, you can choose to visit Sorrento, alongside picturesque towns such as Positano, Amalfi, and Ravello – each of which has its own delightful look and unique charm. Well worth the cost, it is one of the best ways to see as much of the wonderful Amalfi Coast as possible in one day. See trip reviews & prices. Off the coast of Italy, in the Bay of Naples, is the island of Ischia. This makes for a wonderful day trip from Naples that takes you away from the city and to a getaway destination. While it feels like a world away, it is actually just a short boat journey between Naples and Ischia. Once you arrive, you’ll want to see Castello Aragonese, a 15th century castle you can reach via a scenic stone bridge. The thermal springs of Ischia are known around the world, and you can tour some of these ancient springs or enjoy spa treatments featuring the mineral rich mud from the area. To get to Ischia from Naples by ferry takes an hour to an hour and a half, depending on if you take a fast or slow ferry; the former departs from Molo Beverello and the latter from Calata Porta di Massa. 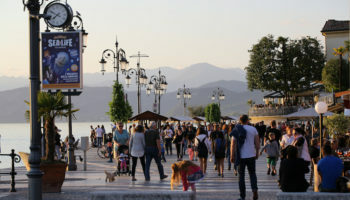 Ferries leave very regularly, though it is a good idea to check the schedule in advance, as times vary depending on the weather, season, and tides. From the port in Ischia, you can take small buses or taxis if you want to visit some of the other small towns that dot the island. Procida is another of the popular islands in the Bay of Naples. Although it is the smallest island in the bay, it still offers a lot to those who enjoy archaeology and ancient history. While Procida is part of Italy, it has a distinctly Greek feel, particularly when it comes to local architecture. In Terra Murata, you can see historic buildings, few of which have been restored or renovated. The port of Corricella is another popular spot, because it is still an authentic fishing port. Procida’s many seafood restaurants are filled with the catch brought in each day by local anglers. Ferries run very frequently to the charming island of Procida from both of Naples’ ports. High-speed ferries leave from Molo Beverello, taking around 40 minutes to arrive in Procida, while slower and cheaper ones depart from Calata Porta di Massa. Once you arrive, you can either take a bus or taxi to explore the rest of the island. A mere 11 km (7 miles) south of Naples is Herculaneum, archeological site with incredible significance. Nearly 2,000 years ago, when Mt. Vesuvius famously erupted and destroyed Pompeii, Herculaneum was also destroyed. While it doesn’t have the same name recognition as Pompeii, it is just as fascinating to tour. Many structures are still unbelievably preserved, including ancient baths, the House of Neptune and Amphitrite and the College of the Augustales. Of particular note are the gorgeous, colorful mosaics in the House of Neptune and Amphitrite that would look at home in a modern museum, despite being nearly two millennia old. It is very fast and easy to visit Herculaneum from Naples by public transport; you could arrive in as little as 15 minutes. 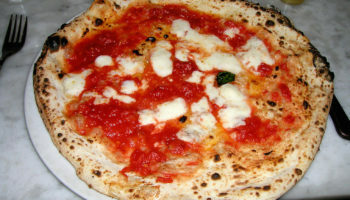 From Napoli Garibaldi, embark on a ten-minute train ride and alight at Ercolano Scavi. From here, you’ll see signs pointing you to the fantastic archaeological site which is just a five-minute walk away. 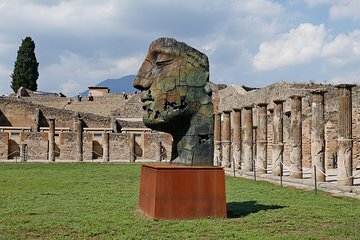 As Pompeii is only 20 minutes further along the same train line, you could visit both historical sites in just one day. If you’re looking to learn more about the history of both Herculaneum and Pompeii, you may want to consider joining a guided tour that takes you around both archaeological sites. 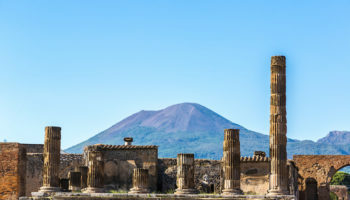 An expert guide will tell you all about Mount Vesuvius’ 79AD eruption and explain the ruins, monuments, and fossils you come across in this fact-filled and enjoyable day trip. See trip reviews & prices. It is not hard to spot Mt. Vesuvius from Naples. The volcano is easily visible from most places in the city, creating a dramatic backdrop to the Bay of Naples. Although visiting sites like Pompeii can be wonderful, don’t forget to actually check out the volcano itself. At Mt. Vesuvius, you can actually see the crater of Vesuvius, from which fumes and steam still rise. 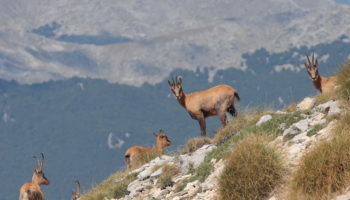 The summit is also one of the best places to photograph the Bay of Naples. On your way back down, try the local wine known as Lacryma Christi, which is made from grapes grown from the volcanic soil on the slopes of Mt. Vesuvius. The easiest way to visit Mount Vesuvius by public transport from Naples is to take a Circumvesuviana train to Pompei Scavi, then take the EAV bus which takes you up the volcano. All in all, it should take you about an hour to an hour and a half to get there, depending on the train and bus connection. On the way up Vesuvius, the bus stops for a photo opportunity. You’ll be dropped off at the coach park, which is nearer to the summit than the car park. Another option is to drive to Mount Vesuvius yourself; this should take you around 40 minutes. Head southeast out of Naples on the A3 and take exit Ercolano, before following Via Vesuvio up the mountainside. You’ll have to pay for parking at the car park, and can then either walk to the summit or take a shuttle bus up to the ticket office. 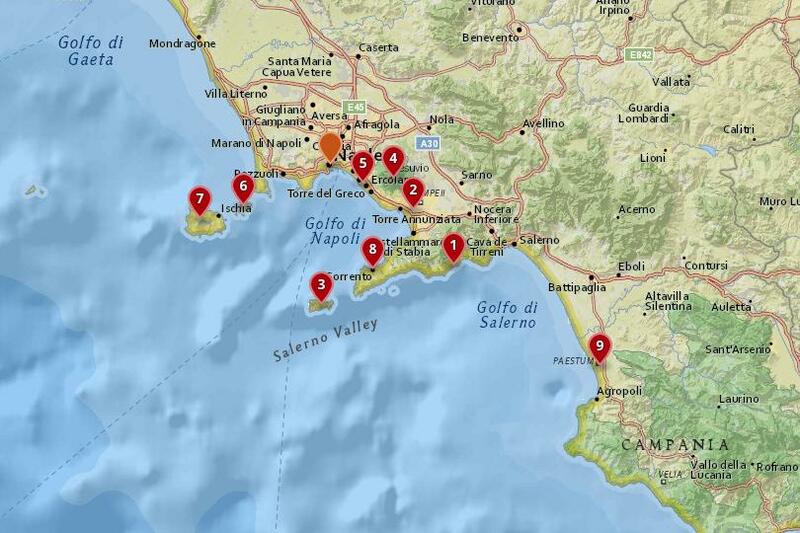 If going by car, you could combine your visit to Vesuvius with a trip to Herculaneum or Pompeii. Many visitors decide to take a guided tour, which takes them to see both the incredible ruins of Pompeii and the summit of Mount Vesuvius. With a knowledgeable guide accompanying you, you’ll learn everything there is to know about the fascinating historical sight and peer into the crater at the top of the volcano. See trip reviews & prices. 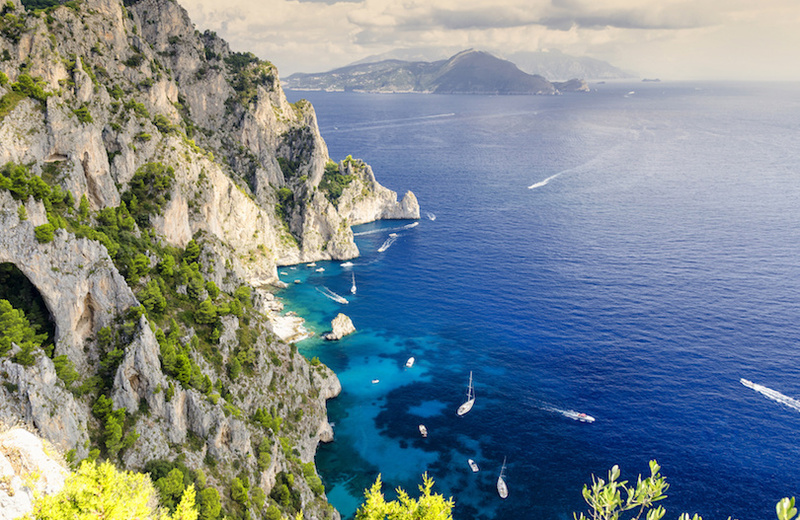 Three miles from the city of Naples is Capri, a stunning island in the Bay of Naples. 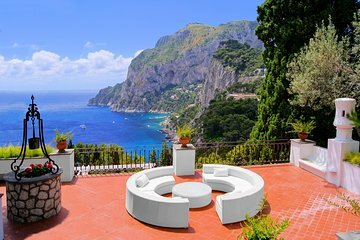 As far back as Roman times, Capri has been lauded as the ultimate getaway destination. 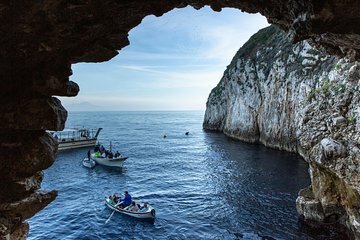 Its Grotta Azzurra, or Blue Grotto, is arguably the most popular attraction on the island, and it is truly a magnificent cave where the luminous turquoise waters appear out of this world. If you’re hoping to escape the crowds, hike some of the paths that wind along the coast, stopping at landmarks like the arch called Arco Naturale as well as several ancient abandoned forts. To get to Capri from Naples, you’re going to have to take a ferry. The views from the deck are breathtaking; you’ll see the island and the Gulf of Naples before you, and Naples and Mount Vesuvius behind you. High-speed ferries depart from Molo Beverello in Naples. While they are more expensive, they only take 40 minutes. Cheaper and slower ferries depart from Calata Porta di Massa; these take 50 to 80 minutes. As the schedules change regularly, depending on the weather, season, and tides, it is a good idea to check in advance when ferries are leaving. Once you arrive in Capri, you can either take buses or taxis around the island. A relaxing and fun-filled way to visit Capri is to take a guided tour to the enticing island. 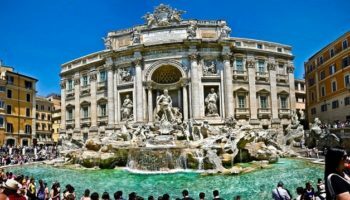 After arriving by jetfoil and enjoying the lovely views on the road, your guide will take you to see fabulous sights such as the Augustus Gardens and the beautiful Blue Grotto. With stops at handicraft stalls, a funicular ride to Marina Grande, and a walk around the town of Anacapri also included, you’ll head back to Naples tired but happy with all that you’ve seen and done. See trip reviews & prices. You can get to Pompeii in under half an hour from Naples, making it a quick but scenic day trip. The ruins of this ancient Roman city are world famous due to an unusual form of preservation as a result of a Mt. Vesuvius eruption. Today, you can walk along the original cobblestones and see ancient landmarks like the amphitheater, which was built more than 2,000 years ago and could hold over 20,000 people at its peak. The oldest ruins at Pompeii are found at the Temple of Apollo, which still boasts many of its original 48 columns and is the most important religious site at Pompeii. As Pompeii has three different entrances, you’re going to want to take a train to either Pompei Scavi, Villa dei Misteri station, or Pompei Santuario, depending on where you want to start. The Circumvesuviana train runs to both these stations and usually takes around half-an-hour to get there from either Naples Central Station or Via Ferraris Galileo. Driving takes roughly the same amount of time. All you need to do is hop on the A3 heading southeast out of the city center. You’ll pass the looming Mount Vesuvius on your left and have the glittering Gulf of Naples on your right. Once you arrive, follow signs directing you to the archaeological site’s car parks. After taking in Pompeii’s impressive sights, you can then drive to visit Mount Vesuvius or nearby Herculaneum. If you really want to get to grips with Pompeii’s fascinating history, a guided tour may be the thing for you. As well as taking you around the awe-inspiring ruins, your guide will also take you on a hike to the top of Mount Vesuvius, where you can enjoy stunning views out over the Gulf of Naples. See trip reviews & prices. Boasting Mediterranean fishing villages, spectacular beaches and access to the mountains, the Amalfi Coast is a clear choice for a day trip from Naples. Keep in mind that the Amalfi Coast is a region, so there are lots of small towns and villages worth visiting. 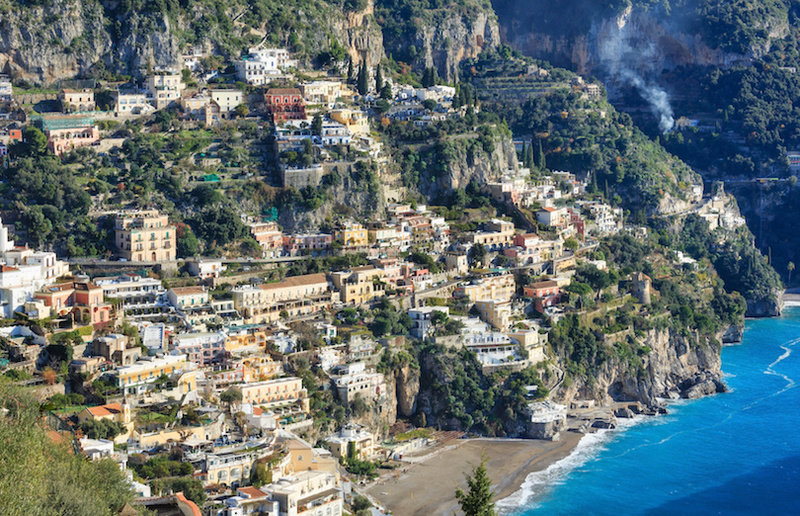 There is a town actually called Amalfi, and it offers a gorgeous 10th century cathedral as well as a popular pebble beach. Nearby, in Positano, where the views are a major draw. From several spots, you can see along the coastline, with peaks creating a gorgeous contrast with the traditional architecture and the crystal clear waters of the Mediterranean Sea. There are a couple of ways to visit the Amalfi Coast from Naples by public transport. It will take you approximately two to two and a half hours to get there. One option is to take a bus from Via Ferraris Galileo to Agerola in Bomerano. From here, you can hop on another bus that will take you along the coast to the town of Amalfi, or the beautiful Positano in the other direction. 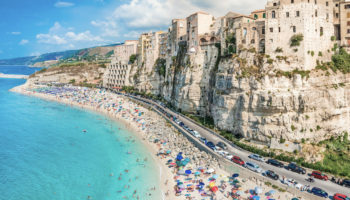 You could also take a train from Naples Central Station to Salerno, then catch a bus along the Amalfi Coast, stopping off at picturesque towns as you go. 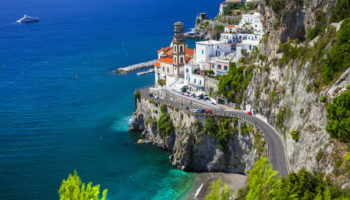 As there are lots of delightful places to stop off at along the Amalfi Coast, it may be a better idea to drive there; this allows you to visit towns such as Sorrento, Positano, and Amalfi at your leisure. To get to the latter from Naples takes about an hour and a half, although this does include toll roads. Simply head southeast on the A3 and follow it all the way to Vietri Sul Mare. Then take the winding SS163 along the coast to towns such as Ravello, Amalfi, and Positano, stopping off wherever you feel like. If you don’t feel like navigating the coastal roads yourself, you may want to consider taking a guided tour. With an expert guide at your service, you’ll visit numerous picturesque towns in just one day, with Sorrento and Positano being just two of the highlights you can expect to see. See trip reviews & prices.